The idea of having free farm-fresh eggs every morning is attracting a growing community of backyard chicken keepers in suburbs and cities across the country. This article will explore the practice of raising chickens for eggs, frequently asked questions, and how dietitians can help clients and consumers do it safely. There are many reasons people choose to raise their own chickens. Some believe the eggs from their hens are tastier, more nutritious, or safer than those they buy in the grocery store. Others believe they can treat their own poultry more ethically than conventional egg producers. But it's important for consumers to have the facts to compare their own perceptions with the reality of commercial egg production. Some consumers are concerned that commercially produced eggs contain harmful pesticide residues.1 But according to Shelly McKee, PhD, director of technical services for USA Poultry & Egg Export Council, the United States has a monitoring program to ensure egg safety—the interagency National Residue Program for Meat, Poultry, and Egg Products. According to McKee, "There has never been a problem in the US because we have a strict wash-out period after the use of antibiotics to ensure that eggs are safe." With USDA oversight, she says, "Antibiotics are given more judicially now to treat disease, not to promote growth." In addition, in the United States, hormones aren't given to any egg-laying hens.2 "[From my perspective] as a scientist, consumer, and mother, we have one of the safest food supplies in the world," McKee says. Terms such as "cage-free," "pastured," and "free range" may not always mean what consumers think. Many consumers are concerned about the number of chickens raised in confined spaces. It isn't uncommon for laying hens to be confined in small spaces for the majority of their lives with little or no access to the outdoors. According to the United Egg Producers' guidelines for cage housing, certified producers who choose to cage their hens should provide between 67 and 86 in2 of space per bird. What many consumers often fail to realize is that choosing organic eggs over conventionally produced eggs doesn't indicate how hens were raised. Emily Kyle, MS, RDN, owner of Emily Kyle Nutrition and The Millennial Garden located in Rochester, New York, says she's become increasingly concerned about the treatment of laying hens. "While I understand that all farms are different, I simply feel a strong peace of mind knowing how my chickens are raised and treated," Kyle says. Before moving forward with raising chickens, it's important to examine your local and state laws. Many cities permit residents to raise backyard chickens and regulate them as pets. For instance, in the city of Marietta, Georgia, just outside of Atlanta, citizens can have up to four chickens as pets and for eggs (but not for meat), provided they have a minimum of 15,000 ft2 of land and keep the chickens in a fenced area with at least 25 ft2 of run space.6 Roosters aren't allowed, but fortunately they aren't necessary for hens to produce eggs. Next, it's time to plan for the flock. Once residents decide how many hens they'd like to raise within legal limits, they'll need to build or purchase a suitable coop, feeders, waterers, and feed, along with bedding. To begin with young chicks, it's necessary to have a temporary brooder (pen) that includes a warming lamp, as well as special feed. Preparation is key to help chickens live up to their potential of laying between 150 and 300 eggs per year (depending on the breed). When well cared for, chickens will lay eggs throughout their lifetime, but will reduce production every year. A whole industry has cropped up to support backyard chicken keepers, including a variety of retailers selling specialty products and providing custom coops. The start-up costs can range from just a few hundred dollars to thousands. The cost of the coop, run, birds, feed, and veterinary fees should all be included. In some cities, consumers can rent chickens, coops, and everything needed to "test drive" raising chickens for about $100 per month. Six years ago, Sarah Krieger, MPH, RDN, a personal chef in St. Petersburg, Florida, says she bought a home-crafted cedar coop online from a relocating family because she wanted her children to grow up with chickens. Her start-up costs were just over $500 and included the coop, six 4- to 5-year-old hens, and a bag of omega-3-fortified feed. Backyard chickens can be a long-term commitment. Chickens may live as long as seven to eight years, depending on the breed, but may stop or reduce egg laying after four to five years. As with most other pets, chickens require daily care. However, you can't board them like other pets, so finding a proper chicken sitter can be a challenge when planning to travel. A 2013 study showed there's a lack of consensus among backyard chicken keepers in critical areas of safe chicken handling.7 The Centers for Disease Control and Prevention (CDC) has documented an increase in salmonella illnesses associated with backyard chickens.8-10 In 2017, the CDC recorded the most outbreaks of salmonella due to backyard poultry, totaling 1,120 cases, including 249 hospitalizations and one death across 48 states.9 At the time of this writing, there were multistate salmonella outbreaks in 2018, with more than 200 sickened.10 These numbers underscore the importance of proper handling. The CDC has developed resources for individuals raising backyard chickens that emphasize proper hand washing as key to preventing the spread of illness.10 Other suggestions from the CDC include avoiding touching the face and mouth after handling chickens, keeping chickens outside of the home, wearing specific shoes only inside the chicken area, not eating in the immediate area of the birds, cleaning all equipment for the chickens outside the home, and not snuggling or kissing chickens. Children younger than 5 and adults older than 65 are at greatest risk of significant complications from salmonella. Another safety issue involves egg refrigeration. Some people believe it's OK to leave eggs out on the counter for long periods of time, but McKee urges people to refrigerate them. "The safety and quality of the egg can be compromised if unrefrigerated. At home, you may not wash them right away, but you should refrigerate to slow the growth of bacteria," McKee says. Eggshells are porous, and, over time, the contents begin to shrink as the egg loses moisture. Refrigeration can help retard that process and keep eggs fresher longer. One of the most commonly cited challenges is keeping the birds safe from predators. Even in urban areas, predatory birds are a significant problem for backyard chickens. Hawks, owls, and even crows will eat eggs and birds that are poorly sheltered. Other potential predators include raccoons, coyotes, snakes, weasels, and rodents. Even domestic dogs and cats can be a danger to chickens. A properly secured coop goes a long way toward thwarting these attacks. Even when precautions are taken, sometimes predators still win. "Unfortunately, I just have to understand that this is the risk that comes along with the reward," Kyle says. Managing the health of chickens also is a potential challenge, but taking preventive measures can make a big difference, as many people may not be able to identify an ill chicken. According to the USDA, many consumers are unaware of Newcastle and Marek's diseases and don't vaccinate their birds against them. Newcastle often affects the bird's respiratory system, while Marek's is most often neurological. Both diseases have high mortality rates for chickens, but neither poses a serious health risk to humans. According to McKee, many places don't allow backyard chickens because of these concerns. She cited a recent outbreak of virulent Newcastle disease in backyard chickens in California.11 Infestation of mites, fleas, and other parasites also can occur and should be treated promptly when discovered. Using diatomaceous earth in the coop, run, and dust bath and biannual deworming can help reduce these issues. McKee's tips for keeping birds healthy include separating chickens from other birds and animals, maintaining a clean and sanitary coop and run, and providing a clean and safe place for them to roost if they're allowed to free range. Owners also should be familiar with basic first aid for chickens and have a reliable veterinarian to treat sick birds; not all vets treat chickens. Lastly, chickens create much waste. Fortunately, chicken waste can be a natural fertilizer. But before using it, chicken manure requires composting to make it safe for gardens. As a rule, chicken waste should be given five to six weeks to break down into compost, reducing the amount of nitrogen and pathogens, before it's used as a fertilizer.12 When it can't be composted or if infestation occurs, waste and contaminated shavings and hay must be discarded. Are Backyard Chickens a Fit? Raising backyard chickens can be fun. Kyle says, "The reward for me is more than just the eggs; it's the entire experience of caring for an animal … a mental and emotional reward of knowing that I'm making my own personal steps towards sustainability and providing the very best for my family." Krieger says she enjoys sharing her eggs with her clients and teaching her teenage son about responsibility since he has to help clean the coop each week. Since her family's appetite surpasses production, she buys eggs at the store to supplement her family's needs. When counseling interested clients, dietitians should educate them about the cost vs benefit, address common misconceptions about commercial egg production, and teach clients about the need for safe handling practices and potential challenges to raising backyard chickens. Krieger is passionate about this topic and believes it's a great experience for dietitians. 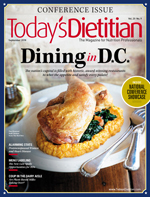 "The more dietitians get our hands dirty … the better nutrition professionals we are," Krieger says. — Sherry Coleman Collins, MS, RDN, LD, is president of Southern Fried Nutrition Services in Atlanta, specializing in food allergies and sensitivities, digestive disorders, and nutrition communications. Find her on Twitter, Instagram, and Facebook as @DietitianSherry, via the Southern Fried Girlfriends podcast, and at www.southernfriednutrition.com. 1. Residue chemistry. USDA website. https://www.fsis.usda.gov/wps/portal/fsis/topics/data-collection-and-reports/chemistry/Residue-Chemistry. Updated July 20, 2018. 2. Industry FAQ. US Poultry & Egg Association website. https://www.uspoultry.org/faq/faq.cfm. Accessed July 9, 2018. 3. Giannenas I, Nisianakis P, Gavriil A, Kontopidis G, Kyriazakis I. Trace mineral content of conventional, organic and courtyard eggs analysed by inductively coupled plasma mass spectrometry (ICP-MS). Food Chem. 2009;114(2):706-711. 4. Matt D, Veromann E, Luik A. Effect of housing systems on biochemical composition of chicken eggs. Agron Res. 2009;7(2):662-667. 5. Samman S, Kung FP, Carter LM, Petocz P. Fatty acid composition of certified organic, conventional and omega-3 eggs. Food Chem. 2009;116(4):911-914. 6. File Reference 20161196; Ordinance 7946. City of Marietta, Georgia website. http://www.mariettaga.gov/DocumentCenter/View/3646/CA2017-03-Chicken-Ordinance?bidId=. Published February 8, 2017. Accessed July 10, 2018. 8. Keeping backyard chickens and other poultry. USDA website. https://www.cdc.gov/features/salmonellapoultry/index.html. Updated June 8, 2018. Accessed July 10, 2018. 9. Centers for Disease Control and Prevention. Multistate outbreaks of human salmonella infections linked to live poultry in backyard flocks, 2017 (final update). https://www.cdc.gov/salmonella/live-poultry-06-17/index.html. Updated October 19, 2017. Accessed July 9, 2018. 10. Centers for Disease Control and Prevention. Multistate outbreaks of salmonella infections liked to contact with live poultry in backyard flocks, 2018. https://www.cdc.gov/salmonella/backyard-flocks-06-18/index.html. Updated July 30, 2018. 11. Flynn D. Virulent Newcastle Disease means backyard chicken craze needs to clean up its act. Food Safety News website. http://www.foodsafetynews.com/2018/06/virulent-newcastle-disease-means-backyard-chicken-craze-needs-to-clean-up-its-act/#.W0UP8y3MxTY. Published June 21, 2018. Accessed July 10, 2018. 12. Saliga R III, Skelly J. Using chicken manure safely in home gardens and landscapes. University of Nevada website. https://www.unce.unr.edu/publications/files/ho/2013/fs1323.pdf. Published 2013. Accessed July 9, 2018.